Comments – This very unique hunting tract has a lot to offer. An old 1840&apos;s dogtrot home is located on the property which adds some history to the place. 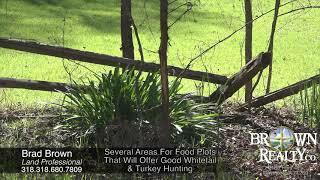 The beautiful hardwood bottoms will provide excellent whitetail and turkey hunting. There is also about a 1-acre pond nestled back in the woods where you can catch largemouth bass. This tract is one of a kind! Check it out!